Are you ready to skyrocket your marketing campaigns on Instagram? If you want your Instagram marketing to be effective then you need to invest in the right tools to help you to Manage and grow your Instagram. In this article, we will share with you top 10 amazing tools to skyrocket your Instagram marketing. Instagram is one of the most powerful social media network platforms for business. Instagram engagement rate is 84 times higher than Twitter, 10 times higher than Facebook, 55 times higher than Pinterest. Perfect and powerful marketing strategy is the key to success. You might be wondering how to become Instagram famous using these amazing tools. Here are some tools that can help you skyrocket your Instagram Marketing. Using Free Bad Tools or fake tools for Instagram Marketing and automation can cause your account to be removed or banned. That’s why we always recommend you to use Paid tools for your Instagram Marketing or trusted tools. Because this little amount of investment can give you much more profit and help you to take your Instagram marketing to the next level. Here are top 10 amazing Instagram tools to Skyrocket your Marketing. Likegrowers is one of most powerful and professional Instagram auto liker tool to help you to grow fast on Instagram. Likegrowers Instagram Marketing tool lets you like pictures based on Locations, Hashtags and usernames. This tool is specially designed and developed for Instagram marketing. If you want to reach target audience or promote your business in the front of the right peoples then this is one best tool for your Instagram Marketing campaigns. Price: Likegrowers Is paid tool and it is really cheap as compared to other Instagram auto likers. Their packages start at $9.99 for 25k likes, $34.99 for 125k likes and $49.99 for 250k likes. The buffer is one social media management platform to manage and schedule your social media accounts. This is one of a great tool for your Instagram to manage and schedule your Instagram posts effectively. Buffer lets you publish and schedule upcoming posts on multiple social media platforms like Instagram, Facebook, Pinterest, and Twitter and also provide deep analytics to track your social media marketing campaigns. Price: Buffer is free for up to 10 posts. Their packages start at $15 to $399 per month. Instagram Hashtags are the best way to grow fast on Instagram. Tagboard is one of amazing innovative software that is used for refining your Hashtags. Tagboard lets you get more deep information about the hashtags that you’ve found. Tagboard software comes with amazing features which include tagboard live tool, keyword filters, and superior Eventbrite, Hootsuite, and Google Chrome extensions. This is one of a great tool for marketers, brands, and agencies. Price: This tool is much more expensive. Their packages starting at $500 per event to $2500 per event. Canva is amazing picture editing tool to design your Instagram Images and make them more beautiful and attractive. Canva tool can help you to create your Instagram Ads, Instagram Promotions and offers. 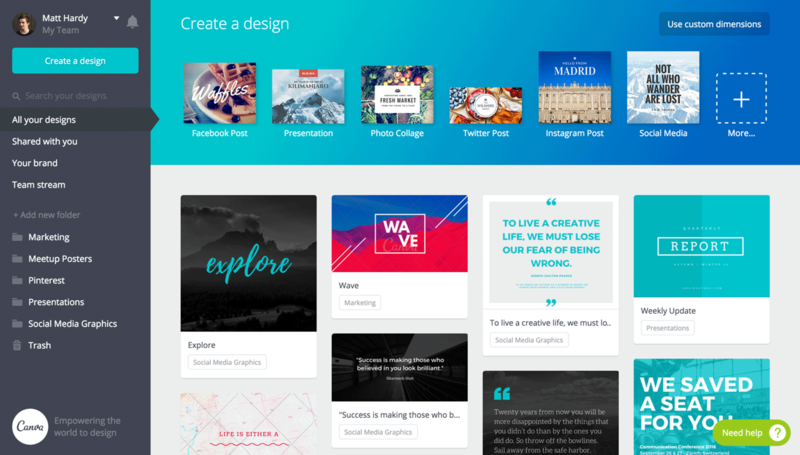 Even if you are not a good Graphic designer then Canva also offer ready-made templates that you can use to create beautiful Images. Price: Canva is free image designing tool but there are some elements, Images, and templates that are paid. Bitly is world leading URL Shortener and link management platform. Bitly Lets you to short your URL and track individual link. Using this amazing tool you can short your Instagram URL’s and track your website traffic, Region and much more statics. Bitly is the great platform to short your URL’s share on all social media platforms and track your traffic. Price: Bitly is free for everyone to use. They also provide enterprise solution to large companies and which is their paid service. Know about absolute ways to make money online without investment. All the tools that are listed above can help you to skyrocket your Instagram Marketing. They are really great tools that you need to use in your Instagram Marketing strategies. Some tools are paid and some are free to use. But this little investment can give you much more benefits and skyrocket your Instagram Marketing. If you are already using any tool that is listed above then share your experiences in the comments section so other peoples can also learn from your experiences. You can check out the one at Social Shark, you just have to create an account. but it’s free.